Life is too short to waste on boring crafts. 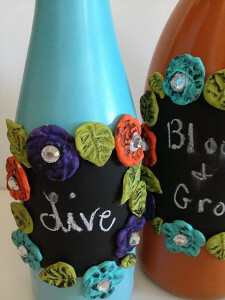 Instead of doing the same old recycled crafts, try out some wine bottle projects. 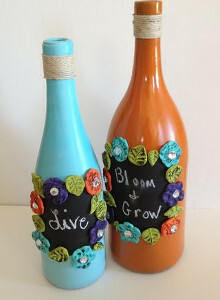 This Chalk All Over Wine Bottles craft from Melony Bradley will let you explore different paints to create totally unique home decor. The glossy and vibrant colors stand out even more against the chalkboard paint on these bottles. Use these refashioned wine bottles as vases to show off your freshly picked flowers. You'll love walking by these brilliant vases and seeing a personalized message chalked on the bottles. Brush on Gloss enamels in Bright Orange and Calypso Blue onto bottle. 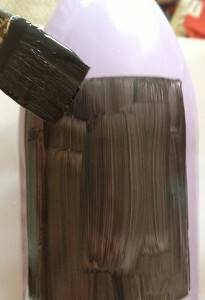 Once you have several coats on the bottle in the desired opaque finish, bake them according to the manufacturer's instructions to cure the paint. Use a rectangular card stock template to trace the shape using a black permanent marker. To add the chalkboard paint to the bottle, use DecoArt's Chalkboard Paint for glass and a 1" brush to paint inside the traced rectangle. It will take more than one coat to get a nice opaque covered here. 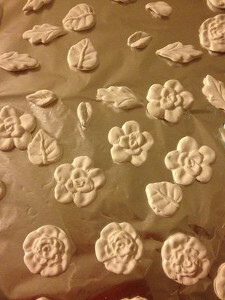 While paint dries between coats, use a push mold and white Sculpey III to form several leaves and flowers. Bake according to manufacturer's instructions and let cool. Use DecoArt's Americana Acrylics to paint the pieces in shades that coordinate with the Gloss Enamel colors. You can dry brush your pieces with Lamp Black for a vintage look. 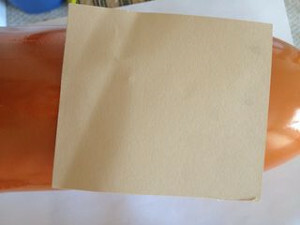 Use a super strong adhesive to glue the clay shapes to the edges of the bottles while the bottles lay on their sides. Work on one area at a time. 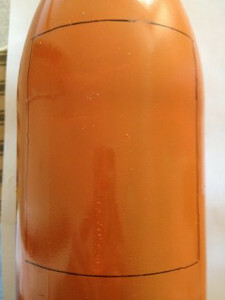 Add some hemp from Hemptique to the neck of the bottles, wrapping around several times and securing with tacky glue. Switch the messages out depending on whatever sentiment inspires you or with the changing of the seasons. These colors will be suitable through Spring, Summer and well into Fall.